Nigel Farage declared on Tuesday that it would spark a political "revolution" - a line he apparently stole from US Sen. Bernie Sanders - and strike fear into the hearts of ineffectual Tories who have so far failed to deliver on the promise of the Brexit referendum, the Sun reports. In an interview with the Sun, Farage revealed the official launch of the Brexit Party would take place during an event in Coventry on Friday. He warned that the new party would contest every region in the May 23 European Parliamentary elections, which he believes will happen after the UK receives another Article 50 extension. The party, Farage said, would dedicate itself to fighting back against "the betrayal of democracy" by May and the Tories, though a twitter account for the Brexit Party added that if you supported Brexit, "both parties have failed you." If you voted for Brexit both parties have failed you. That is why The Brexit Party is so important. We are the party for 17.4 million. 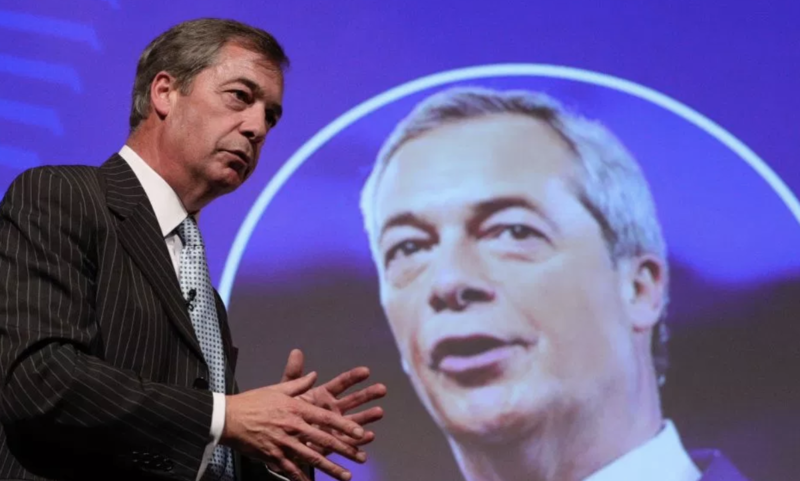 Farage's goal with the Brexit Party is to upend the British two-party system in its current form. His announcement followed remarks from Tory Brexiteer MP Anne Morris, who said she might vote for the Brexit Party if European elections happen. Confirming he will stand to become an MEP, Mr Farage said the party had been inundated with "just under 1,000" requests from people wanting to be a candidate. And he told The Sun: "I said in 2013 that UKIP was going to cause an earthquake in British politics and I think we can safely say we did that." Farage, who said that he's already received just under 1,000 requests from people seeking to be candidates, also revealed that he sat down with President Trump last month. He told his audience that the White House has been shocked by the utter disaster of the Tory-led Brexit process, and that it's a shame lawmakers inside 'the Westminster Bubble' have failed to understand the will of the voters, Farage said. "There are several people in the American administration American administration who are looking on with incredulity that what they thought was a great country suddenly is being humbled by foreign bureaucrats." But some of Farage's most scathing criticism was reserved for Prime Minister Theresa May, whom he declared 'the worst prime minister in my lifetime,' as well as the most 'duplicitous'. "I can’t believe she has ever been involved in any negotiation of any kind at any point in her life. She is without doubt the worst Prime Minister in my lifetime and the most duplicitous – she says one thing and does the other again and again and again." The British people, particularly those who voted for Brexit, are being treated 'with disdain', Farage said. And the feeling that the Kingdom's politics has broken down has become pervasive. "There is a feeling that politics is broken, the public is being treated with utter disdain. There is a break down in trust between the Government and the governed and I would add to that a feeling that the Government is incompetent. How can it be that 3 years on we have got nowhere?"